All my technical indicators bottomed out last week and the Nasdaq has climbed back to new highs for the year already. The Earl is reaching overbought territory, but the Earl2 and MoM indicators suggest that there is more room to rise. 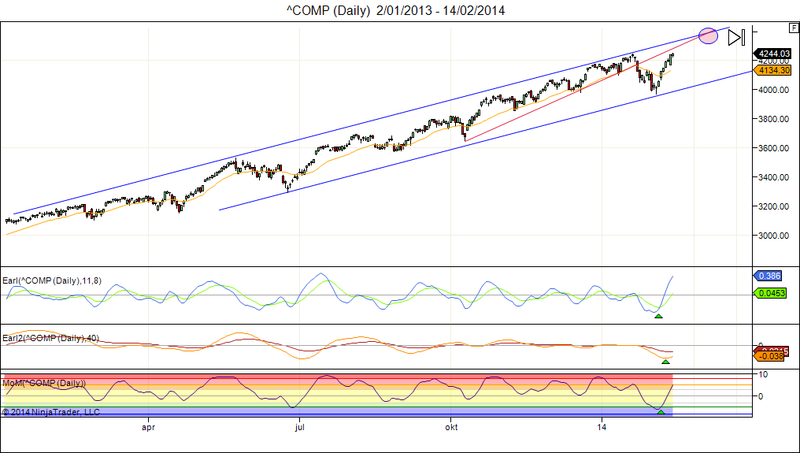 Based on the long term trend channel the Nasdaq can climb to approximately 4350 by early March. This entry was posted on February 17, 2014 at 1:27 pm	and is filed under Financial Astrology, Market Commentary. Tagged: lunar cycles, Nasdaq. You can follow any responses to this entry through the RSS 2.0 feed. You can leave a response, or trackback from your own site. i m a stock & commodity advisor & trader from india.pls guide how your software may help me in & how much we can rely on it. If you still have questions then just mail me through the contact form on the lunatictrader site.